Court reporting students from the Des Moines Area Community College in Iowa joined students from the school’s nursing program and hundreds of other volunteers to help package 20,000 meals to help fight hunger, according to an article posted by the Newton Daily News on Nov. 14. The meals will be going to the disaster relief effort in Puerto Rico. Mike Hensley, RPR, is an unusual reporter in that he completed court reporting school entirely online. 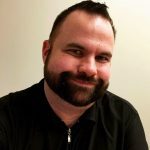 He is a 2015 graduate of Sage College and currently works as a freelance reporter in Evanston, Ill. (although he will be moving to the San Francisco, Calif., area by the end of 2017). 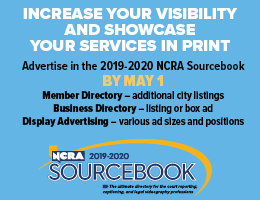 Hensley is also in his second year as a member of the NCRA New Professionals Committee. Why did you decide to go to court reporting school online? What factors went into your decision to choose your school? I went online primarily because the school I was interested in was based in California, and I was facing an upcoming cross-country move to Chicago. I didn’t want to miss the opportunity to attend school with the facility I found; so online schooling was the best available option to meet my needs. I also wanted the flexibility to complete school on my terms and on my schedule since I was an independent adult working full time. How did you fit classes and practice time into your schedule? I worked a full-time job, and even at one point, I had a full-time and part-time job while attending school. I had to be very creative in finding time for fitting in school. Luckily, my full-time job was a graveyard shift, Friday-Monday job. The job also had a lot of dead time where my boss encouraged me to bring something to do. He himself mentioned that he completed a master’s degree program while working my particular shift; so it seemed like a good fit to allow me to complete my own schoolwork. As far as practice time, I really had to push myself to forego personal activities and use my non-work time to practice as often as I could. I had to remind myself that sacrifices during school would only be temporary, and it would pay off later when I achieved my new career. What did you do, if anything, to find a court reporting support network without having in-person classes? I found Facebook to be a great resource for networking with court reporters. Along with that, my school provided a good source for coaches and mentors through the school staff as part of the online program. As I joined more court reporter groups through Facebook, I developed a presence among court reporters and was able to connect with several individuals who offered to become mentors and eventual friends. Who or where did you go to for advice on steno theory, selecting software, speedbuilding, and so on? My school primarily had a good plan of direction for guiding us with software and speedbuilding materials through their online program. As I progressed through school, I kept my eyes open for other sources of material. I obtained a large amount of information through word of mouth from other reporters and online students. Online students sharing with one another can be a great resource because we’re all looking for the most efficient and cost-effective (i.e. free) tools for practice. What was the biggest challenge you faced about studying online? How did you overcome that challenge? My biggest challenge was time management initially. The first two years of school were a combination of academics and speedbuilding; so I had to balance both practice time and homework time along with my work schedule. Once I completed academics, I was able to focus solely on speedbuilding, and things became less complicated. As an online student, you have to be your own coach at times. I had to really dig deep and find the drive to push myself to make time in my schedule for practice. It really helped to surround myself with things that reminded me of my goal. At one point, I kept a vision board with pictures of things I wanted as a result of my new career: things like my steno machine, vacation destinations, etc. What advantages did you find to attending school online? I was able to complete schoolwork at times that were most advantageous to me so that I could still maintain my full-time job. I was also able to tackle as much or as little as I wanted. Usually, I leaned towards tackling more because I wanted to finish as soon as possible. Personally, I wanted to attend school and focus on the program without any distractions, and knowing my personality, if I had gone to a brick-and-mortar school, I would have found myself distracted by the social environment. But that’s just my personal observation. I think one of the strongest advantages to online schooling is that when you know yourself and you know that you are dedicated enough to buckle down and do the work that you need to do, then it can be a very suitable option to complete school. Describe the transition from school to working – were there any factors from having been an online student that make you think this transition was slightly easier or slightly harder? I do admit, when I started as a reporter, it felt strange to set up my equipment in someone’s office as opposed to setting up in my living room. However, that adjustment was minor and was easily overcome. I think that being an online student made it easier for me to transition because I didn’t become accustomed to going to a school facility and being in that environment before entering the working world. In my mind, whenever I sat down at my machine, I was already in the working world. By the time I entered the field, I already felt like I had been a court reporter because I had spent so much time envisioning it during my education. 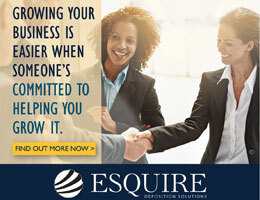 What do you think firms and courthouses should keep in mind when hiring students who graduated from an online program? Firms should bear in mind that they may need to spend a small amount of time discussing professional etiquette with an online student, especially if for some reason the online student didn’t have the opportunity to shadow a working reporter. If that did not occur, I would highly recommend that the firm arrange for the online graduate to shadow a reporter to see what it looks like to do the job. Firms and courthouses can expect that online students are well versed in using technology to complete tasks, and therefore they are more likely to communicate through methods like email and/or text message. Online students may also be more adept at submitting work product through electronic means such as email, an online portal, or a cloud-based system. What do you think working reporters can do to help online students specifically? Do you have any final thoughts to share? 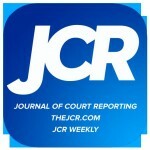 I feel that my online education prepared me to be a new breed of court reporter. When I began working in the field, I was not afraid of jobs that involved videoconferencing or telephonic participants because I had dealt with these sorts of issues to complete my education. Online schooling also gave me an awareness of many forms of technology available to me as a future professional. When I began working, I was comfortable with completing paperwork electronically and submitting it to whomever requested it. This allows me to be comfortable in working with out-of-state agencies when coverage is needed in my home area. Online schooling also made me strongly accustomed to being realtime-ready. I was connected to a computer 24/7 through my education. Now that I’m a professional reporter, I embrace various technologies to help me do my job as best as I can. With the uncertainty of many brick-and-mortar programs, I feel that online education is truly a wonderful option to keep the education of court reporters alive and well for the years to come. The Oct. 26 Retriever, a publication of the University of Maryland, Baltimore County, published an article that stressed the importance of making college websites accessible to all interested parties, including using closed captioning for people with hearing impairments or audio descriptions for people with vision impairments. The article referenced a recent lawsuit won by plaintiff Emanuel Delacruz, who is blind, and noted that colleges are violating the Americans with Disabilities Act if they are not providing such accommodations on their websites. The court reporting and captioning professions captivated attendees at the annual open house held April 25 by Cuyahoga Community College (Tri-C) in Cuyahoga, Ohio. 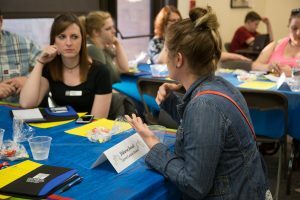 Sponsored by the college’s court reporting and captioning program, the event drew 75 attendees wanting to know more about the career choice and benefits. Stefanie Sweet, a current student enrolled in Tri-C’s court reporting and captioning program, shares some insight into campus life and educational curriculum with open house attendees. According to Kelly Moranz, CRI, Tri-C’s program manager, attendees got an overview of the court reporting and captioning professions, including information about various work venues, earning potential, flexibility, and the college’s program. Attendees then embarked on a speed networking activity that allowed them to ask faculty, professionals, and current students more about available career opportunities, campus life, and scholarships. Other topics addressed during the speed networking activity included a brief overview of the theory of steno, the importance of good English and grammar skills required by court reporters, examples of real-life experiences shared by professionals currently working in the field, and the chance to try writing on an actual machine. Roughly 20,000 free educational videos provided by the University of California, Berkeley, are being taken off the Internet because they do not have closed captioning, according to a article posted March 7 by The Washington Times. LeTourneau University, Longview, Texas, is holding “Law as a Career Day” on Feb. 16 for college and high school students interested in legal careers, according to a Dec. 19 article in the Tyler Morning Telegraph. Law, paralegal, and court reporting schools will be at the event to provide information and answer questions about their programs. The university is also hosting a formal court session of the Texas Supreme Court to hear oral arguments in two cases. The Nov. 3 Ottawa Herald posted a photo and caption of NCRA member Cindy Isaacsen, RPR, demonstrating realtime reporting to students attending an open house hosted by the Neosho County Community College in Ottawa, Kan.
USA Today Network reported on Feb. 21 that Lakeshore Technical College, Cleveland, Wis., is hosting informational sessions for individuals interested in learning more about earning an associate degree in its court reporting program. Lakeshore Technical College is one of only two colleges in the state to offer a degree in court reporting. 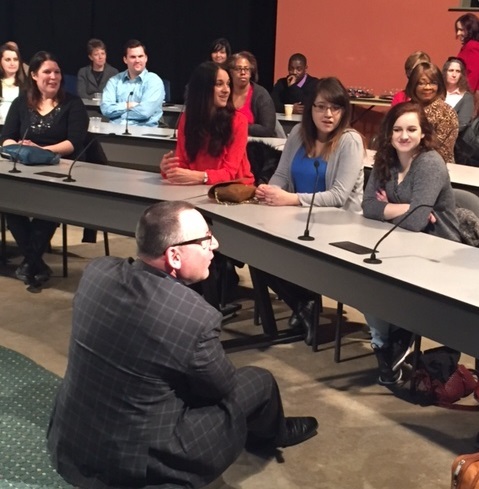 NCRA President Steve Zinone, RPR, an official court reporter from Pittsfield, N.Y., presented a keynote speech to students, faculty, guests, and online students at Cuyahoga Community College in Cleveland, Ohio, on Feb. 17. Zinone shared with students his career experiences and highlights, as well as the importance of being involved in court reporting associations at the state and national level, and offered advice on how to succeed in the profession. He also noted the many job opportunities open to court reporters including official positions, freelance reporters, captioners, and CART captioners. Zinone was invited by the program’s Captioning & Court Reporting Club.